This time around I’m switching things up a little and have put together a Canadian gift guide that gives back. All of these items from Canadian companies work great as a gift for your loved one on Valentine’s Day if you’re looking for something unique and meaningful. If you like to shop during this Hallmark Holiday, why not feel good about buying and spreading the love around by helping those who need it. 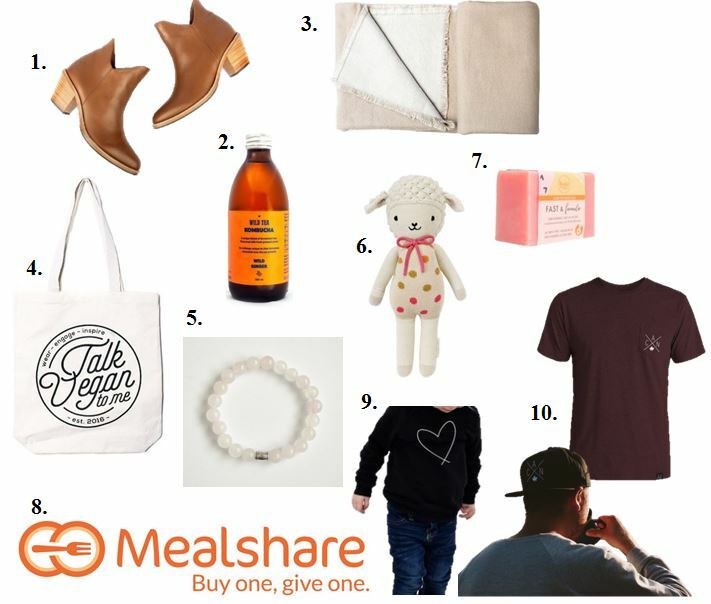 Today I’m sharing 10 of my favourite Valentine’s Day Gifts That Give Back. Poppy Barley – The Two Point Five Ankle Boot – This Canadian company, based out of Edmonton, AB and manufacturing in León, Mexico is ethically and socially conscious. They focus on designing luxury shoes for men and women and accessories. Their quality products might have a higher price tag but they’re worth every penny, especially knowing how they are made and the good that comes from it. In Canada, they donate 0.5% of sales each quarter to a different not-for-profit partner. In 2017 they donated to The Heart and Stroke Foundation, Norquest College, Habitat for Humanity, and the Mazankowski Heart Centre. In Mexico, 0.5% of sales goes back to the people who make the shoes. They also ensure their workers are paid, on average, six times the region’s minimum wage. Your Valentine is sure to love anything from this line!!! 2. Wild Tea Kombucha – Wild Ginger – Wild Tea Kombucha is a hand brewed bold fermented tea that is mixed with fresh pressed juices. They are based out of Calgary, AB and sold at numerous locations all the way from B.C. to Ontario. Check out where you can get your hands on one here. Co-founders Brigette Freel and Emily Baadsvik care about the environment and want to make sure our children have a future. They have also chosen to support the Branch Out Foundation. For every Wild Ginger Kombucha sold, 10% of the sales is redirected to support Branch Out to help them in their mission to mitigate and eliminate the 600+ diseases of the nervous system that affect nearly 20% of the world’s population. Pick up a drink for you and your loved one to enjoy this Valentine’s Day! 3. Obakki – The Cinder Blanket -Obakki is based out of Vancouver, B.C. and the designer’s line has been seen on celebs like Gwyneth Paltrow and Kate Hudson, and featured in Elle and Vogue UK. She designs beautiful, timeless pieces that are wearable for the classic woman; offering everything from tops to pants, jackets, dresses and accessories. The Obakki Foundation, Obakki’s philanthropic counterpart, is a charity that focuses on providing clean water and education in Africa. 100% of the Obakki Foundation’s public donations go directly to their charitable initiatives like providing clean water and education in Africa. And to date, Obakki has provided access to basic needs for over 2 million people in South Sudan, Cameroon and Uganda. Everything in this line is gorgeous to spoil the woman you love, but you will be directly giving back when you purchase The CINDER blanket because it helps transform the lives of those in desperate need relating to Obakki Foundation projects. 4. Talk Vegan To Me – Tote Bag – Here’s another great local company where animals are at the heart of their focus. They donate 10% of their proceeds to two Alberta farmed animal rescues: The Alice Sanctuary and Robin’s Refuge. These sanctuaries provide love, care, and forever homes to over one hundred animals including horses, donkeys, goats, cows, pigs, chickens, ducks, cats and dogs. If you’re into a vegan lifestyle you’ll want to support their cause. They have a cute apparel line like this unisex crew neck sweatshirt and this tank. I also love this tote bag and think it would be cute for someone to fill it with vegan ingredients to make a home cooked meal as a romantic Valentine’s Day dinner! 5. Alora Boutique – Unconditional Love, Self-Love & Kindness Beaded Stretch Bracelet Rose Quartz Gemstone – This is such a pretty, feminine bracelet by Alora Boutique that any woman would love to wear and feel proud wearing. With every purchase, 5% goes towards transitioning women out of poverty, homelessness, or abusive situations. Read more about Alora’s community involvement here. This would be a great bracelet to gift someone for Valentine’s Day! 6. Cuddle + Kind – This Canadian company is doing awesome things! For every doll sold, it provides 10 meals for a child. Their goal is to provide 1 million meals a year. WOW! The charities involved are World Food Program USA, Children’s Hunger Fund (CHF), and Breakfast Club of Canada. Cuddle + Kind’s beautiful hand-knit dolls are handmade by artisans in Peru. What’s also great is that they can provide these women with sustainable, fair trade income. The dolls are soft, safe and cuddly for your child or make for a great Valentine’s Day gift for kids! I think my favourites are Lucy the Lamb and Noah the Dog. 7. Rocky Mountain Soap – Fast & Female Soap – Rocky Mtn Soap has collaborated with Fast & Female, a non-profit that focuses on empowering young women in sports, ages 8 to 18, across North America. Read all about it here. This floral-mint soap is the perfect little gift for Valentine’s Day. 8. Mealshare – Mealshare is a great opportunity to give back during Valentine’s Day. If you plan on eating out with your Valentine, why not go to a partnering restaurant to help spread the love to a youth in need of a healthy meal. Some of the 50+ Calgary restaurants participating include: River Cafe, Market, National, 10 Foot Henry, Diner Deluxe, Fiasco Gelato, Briggs Kitchen & Bar, Yellow Door Bistro, Una Pizza, Alloy, and Craft. You can find a local restaurant here. When you order a meal off the menu that has a “mealshare” logo beside it, restaurants will give $1 to Mealshare. Mealshare then donates the money to local partnering charities that have teamed up and they go out and purchase the groceries needed to create a meal. Read all about it here. The local Calgary charities involved are Brown Bagging for Calgary’s Kids and the Calgary Drop-In & Rehab Centre. View the complete list of charities participating in other Canadian cities. 9. Love for Lewiston – Heart Kids Crew Sweatshirt – The Love for Lewiston Foundation was created by the Olstad Family after losing their beautiful baby boy to SMA-type 1. Little Lewiston was only here on this earth for a short time but the impact he made on those around him and the wonderful good that the Olstad Family continues to do is unbelievable!!! The Olstad’s set out on a mission to give back to all of those who helped them in their time of need and raise money and spread awareness for Spinal Muscular Atrophy (SMA) and The Alberta Children’s Hospital Foundation . They’re all about spreading love and joy and directing money to local families going through similar circumstances. When you purchase something from their apparel line, part of the proceeds go towards SMA Research and the Alberta Children’s Hospital. They carry children and adult sizes in a variety of pieces. The heart logo is perfect for celebrating Valentine’s Day this year and represents – movement, which brings the joy and allows everyone to spread love. The foundation is more than just SMA. They’re encouraging people to live full, bold and joyful lives. 10. Local Laundry – CAN Olympic Bundle – Local Laundry has always been about supporting communities. They believe that people should be proud of where they come from and help make it better. 10% of their profits go back to a local charity that their customers choose to support which build a stronger community and help those in need. With the Olympics starting this month, why not get your loved one an Olympic themed Valentine’s gift! Or, better yet, why not get matching attire to watch the games together?? Purchase one of their pocket t-shirt’s with a snapback hat and save 25% on your combined order at checkout. Proceeds will go towards supporting Team Canada. This is my first “gifts that give” post so I’m still learning about companies across the country that give back. It was really fun to research and find some awesome companies out there that are doing their part and giving back to the world. And by sharing this post I really want to help spread the word!! Happy Valentine’s Day! Tell me in the comments below…how are you giving back this month? Previous 15 Stylish Women’s Jackets on Sale! So cute!! You always find the cutest things from places I have never heard of!! Will definitely be bookmarking these shops. Thank you so much, Ally! So happy you like some of these picks. The Cuddle+Kind brand are ADORABLE stuffies for your littles.